In two years, SpaceX will begin ferrying astronauts into orbit. But before it can do so, the commercial spaceflight company must prove to NASA that its ride will be safe. A big part of that guarantee comes from the fire-breathing propulsion system pictured above. 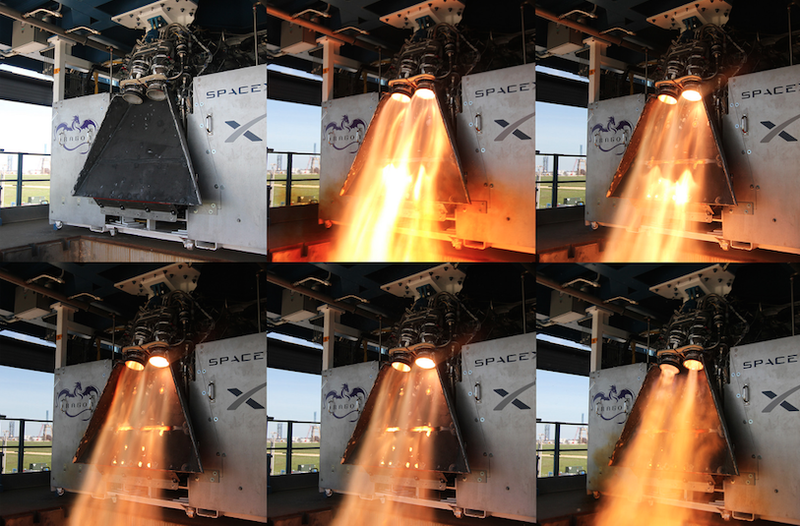 Arranged in four pairs around the outside of a Crew Dragon spacecraft, SpaceX’s SuperDraco engines are a first-of-its-kind launch escape system. In the event of a booster failure on the way to orbit, the SuperDracos will all fire at once, collectively producing 120,000 pounds of thrust. That’s enough to accelerate a Crew Dragon from zero to 100 mph in a rip-roaring 1.2 seconds, boosting the astronauts well out of harm’s way. Eventually, SpaceX plans to use the system in place of a parachute during landings. Each of the engines in the module pictured above has been test fired over 300 times. Just watching them ignite in the lab is getting me stoked for the future of commercial spaceflight.